Two epic films hit China's screen in the past week. Three Kingdoms: Resurrection of the Dragon, which opened on April 3, tells the story of warrior Zhao Yun, who lived during the Three Kingdoms period from 220-265 AD. 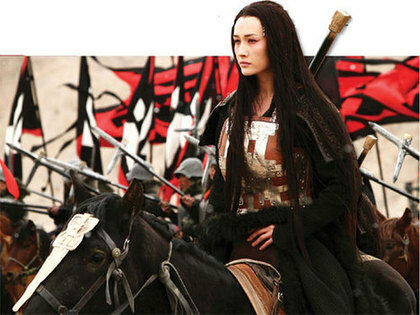 The film is based on Romance of the Three Kingdoms, one of China's four major classical literary works. The hotly anticipated film stars Andy Lau and Maggie Q. An actress who has collaborated with Tom Cruise, Q said her biggest challenge was speaking Chinese and playing pipa, a plucked Chinese string instrument, at the same time. Nanking massacre drama The Children of Huang Shi also hit theaters on April 3. The heroic blockbuster, starring Jonathan Rhys Meyers and Chow Yun-Fat, is a Chinese-Australian co-production. However, the Chinese commander role, played by Chow, has aroused controversy according to media reports. Chow's commander, some audience members complained, is different from a typical 1930s Chinese soldier for he has stylish hair, a romance with a nurse and speaks fluent English. The $40 million project was directed by Roger Spottiswoode (Tomorrow Never Dies) and took more than two years to complete. Spottiswoode says that his ambition was to explore compassion in the war and to promote humanitarianism. The movie tells a story of a young British journalist who saves a group of orphaned Chinese children with the help of an Australian nurse in late 1930s. And the Spring Comes (Li Chun), stars Jiang Wenli, the Best Actress winner at last year's Rome International Film Festival, released on April 11. Set in a backwater province of China during the 1980s, And the Spring Comes tells the story of a plain woman consigned to the fringes of society because of her looks and her overwhelming passion for Western opera. To play the role, Jiang put on nearly 15 kg in a month. In Love We Trust (Zuo You), by six-generation director Wang Xiaoshuai, tells the story of a divorced couple trying to save their terminally ill daughter by having another child. The only problem is, both the divorced couple are remarried. Based on real events, the film won Best Screenplay at the Berlin Film Festival. Slam, from the production team of the official NBA TV program, Made in NBA, led by director Jonathan Lim, is being promoted as the first original movie about street basketball in China. The plot follows three typical Chinese teenagers that are forced to prove themselves in a high stakes three-on-three tournament. A selection of 21 recent French films will be shown at the Fifth French Film Panorama, which is to open in Beijing on April 10. The program will include nine feature films and twelve short films. The films will be in French with Chinese subtitles. At Sun Dong An Cinema City and Star City.